In our group, structure, dynamics and catalysis of the chemical systems of interest are studied by means of classical molecular dynamics (MD) simulations coupled with first-principles-based computational methods (e.g. QM/MM simulations) and enhanced sampling techniques for free energy estimation. This multiscale computational approach includes also docking, virtual screening, de novo small molecules computational design and in silico ADMET evaluation (for drug design). These computational efforts are integrated with medicinal chemistry and molecular biology to identify and optimize novel small molecules able to inhibit the enzymatic function of interest. The goal is to understand the general principles that control molecular recognition and catalysis and use this information to design intelligent nanosystems and potent inhibitors for drug discovery. Our major focus for drug discovery are targets related to cancer, neurological disorders and inflammatory-related diseases. This research line is based on our interest in pharmaceutically relevant metalloenzymes (e.g., Soluble Epoxide Hydrolase, Ribonuclease H and others targets - See publications). Recently, we have focused on Type II topoisomerases (TopoII), targets of clinical antibiotics (e.g. quinolones) and anticancer agents (e.g. anthracyclines). TopoII controls the DNA topology during DNA strand separation in replication, transcription, recombination, and repair of the DNA. In this project, we applied computational simulations to enrich the interpretation of existing structural data on TopoII and describe the dynamic rearrangement of the catalytic two-metal binding site of TopoII during function and inhibition of this important class of enzymes. Now, findings from this computational study are used the help in the identification and design of more effective novel TopoII inhibitors. On this research line, we are collaborating with expert medicinal chemists, pharmacologists and molecular biologists in Europe, forming a multidisciplinary team for drug discovery targeting TopoII. 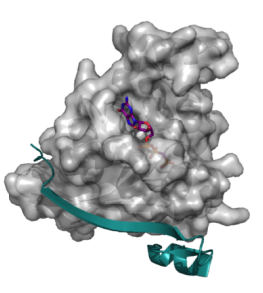 We are looking at other metalloenzymes, too, which are promising new targets for drug discovery. See our recent papers on DNA Polymerase-eta. More on these new targets will follow soon. On this topic, we have focused on the fatty acid amide hydrolase (FAAH) enzyme – main player in the endocannabinoid system and promising target to treat several pathological conditions, including cancer and inflammation. We have highlighted the role of substrate structural flexibility in FAAH catalysis; we have also characterized the mechanism of action of relevant covalent inhibitors of FAAH, providing a rational for the activity of novel FAAH inhibitors. These computational studies on the enzymatic function and inhibition of FAAH have been integrated with medicinal chemistry and pharmacology to rationally design multitarget FAAH/Cyclooxygenase inhibitors. Notably, multitarget inhibitors – i.e. single compounds acting simultaneously on two or more targets - are a pharmacological strategy that holds great promise for designing new and more effective drugs. Along this research line, we have clarified the catalytic mechanism and substrate selectivity of FAAH, in collaboration with experimentalists. In terms of drug discovery, one potent multitarget FAAH/Cox inhibitor has moved into the lead optimization phase, which is currently ongoing. We are now looking at other lipid-degrading enzymes, such as the enzyme MAGL, with the final aim to understand what principles govern enzymatic processing of lipids. We are interested in studying the mechanisms regulating protein kinases. Starting from a detailed understanding of their regulatory mechanisms, we then apply structure-based drug design approaches to discover potent kinase inhibitors. A major drawback of blocking the enzymatic activity of kinases with small molecules that bind the ATP binding site is the frequent development of therapy resistance, often caused by point mutations in the target protein. An emerging strategy to overcome this problem is the targeting of additional sites on the oncogenic driver kinase. 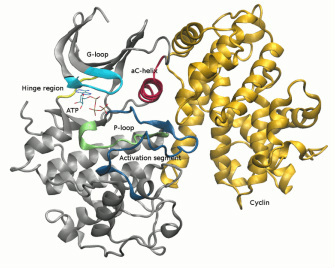 These are identified as cryptic or allosteric binding sites, which are essential for the oncogenic activity of the kinase. Usually, these allosteric sites exist in a range of closely related conformational states, termed an ensemble, of the target protein and, importantly, several such sites were identified in hallmark kinases over the past years (Nussinov et al, Cell, 2013) . In this line of research, we are interested in using multiscale molecular modeling to investigate allosteric sites of targeted kinases, and understand how to modulate the enzymatic function acting on those allosteric sites. Small molecule inhibitors are designed, synthesized and tested to act on those cryptic sites. We are currently working on allosteric sites that regulate protein-protein interactions that are essential for kinase signaling pathways. We currently work on different anticancer drug discovery projects in collaboration with Prof. O. Hantschel and Prof. Matteo Dal Peraro at the EPFL-Lausanne and with Dr. A. Genesan at UCI-Irvine. Pockets far from the catalytic site of proteins can affect their function. In the field of drug discovery, these allosteric pockets are exciting targets for small molecule inhibitors, which can bind and block the target acting far from the catalytic site. However, allosteric sites are challenging to target, since they are often located on the protein surface, with a shape that can vary sensibly during protein dynamics. Molecular dynamics (MD) nowadays permits very extended simulations of flexible proteins, returning a detailed picture of the protein plasticity. However, the amount of data can be overwhelming and almost impossible to visually inspect; new approaches are therefore needed for an efficient analysis of pockets in MD trajectories. In collaboration with the CONCEPT Lab at IIT (Dr. Rocchia), we are developing a new tool for the identification and characterization of pockets that can be applied to the analysis of long MD simulations. This new method allows capturing the presence of transient pockets, tracking their evolution over time, and retrieving communication networks between distant pockets. Taken together, this information helps understand how these sites affect protein function. The multifunctional nature of these nanoparticles permits to design and construct artificial systems with precise and efficient functionality. 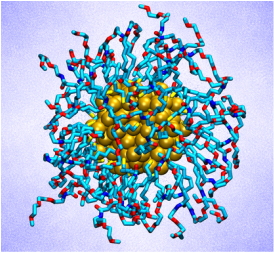 In this regard, we are using atomistic simulations to understand general principles that regulate the dynamical behavior of gold nanoparticles. Insights from these computations are used for the fine-tuning of experimental parameters, moving forward innovative applications of these exciting ultra small objects. This line of research is in collaboration with the experimental group of Dr. F. Mancin, and Dr. F. Rastrelli at the University of Padova, Italy. Recently, we have started to work on a possible pharmacological intervention to treat cognitive impairment in a number of neurodevelopmental disorders, a currently unmet medical need. To this end, we aim at the functional and structural characterization of pharmaceutically relevant ionic membrane transporters, which are novel targets for therapeutic intervention in these neurological diseases. Importantly, the research line develops in close collaboration with Dr. Laura Cancedda’s laboratory of ‘Local Micro-environment and Brain Development’, at IIT. Together, we work on the design, synthesis, and in vitro/in vivo validation of new compounds for selective inhibition of the targeted ionic membrane transporters.